All summer long, while voluptuous tomatoes, slender beans and tender young greens make their flashy performances, the humble root vegetables lie calm and still in the warm summer earth, waiting patiently for the coming of autumn. As soon as the first leaves begin to turn and drop, as the beans wither and the tomatoes turn to mush, they’re ready for their starring roles in the produce world. Turnips. Strong and sassy, with an assertive aroma, the turnip is a misunderstood root with an undeserved reputation. Like beets, turnips have long been mistreated in the kitchen. Handled properly, however, turnips have a subtle, nutty sweetness and compelling aroma. Like other crucifers, turnips are essential for detox; they help metabolize harmful forms of estrogen, and they’re rich in anti-cancer compounds. In Newfoundland, turnips are traditionally prepared in a savory stew with yellow peas, a method that highlights their flavor and still permits them their stubborn individuality. Try this: Cut turnips into strips, toss with olive oil, sea salt, black pepper and cayenne, and roast until crispy; sauté chopped turnips with leeks and fennel, and top with crumbled blue cheese and chopped fresh basil. Carrots. The sweet, tender carrot is perhaps the most universally loved root of all. Maybe it’s no coincidence that it’s also one of the most nutritious. Carrots are rich in beta-carotene, a cancer-preventive antioxidant that lends them their bright yellow-orange hue. Beta-carotene and other carotenoids may also have a protective effect against hyperglycemia and diabetes. Happily for us, enterprising researchers are breeding carrots with different colors. The most promising include a red carrot that’s high in lycopene–an antioxidant that helps protect against prostate cancer–and a purple variety that contains anthocyanins, the same cancer-preventive antioxidants in blueberries. Both nutrients are essential for daily detox. Incidentally, for the reluctant or harried chef, frozen carrots have the same amount of beta-carotene as fresh. Try this: Combine shredded carrots with plain yogurt, minced cilantro and cumin; puree frozen and thawed carrots with cooked or canned chickpeas, olive oil, lemon juice and garlic for a fresh, colorful hummus. Sweet potatoes. Many of us were introduced to the sweet potato in its miserable holiday incarnation–drowning in syrup, cooked to a mush and burdened with marshmallows. But baked in an oven and unadorned by toppings, these brilliant orange tubers are sweet, moist and magnificent in their naked simplicity. Many of us also grew up calling sweet potatoes “yams,” but the yam is the tuber of an entirely different plant, a starchy, mealy variety that hails from Africa and can grow to monstrous proportions of 8 feet long and 150 pounds. Like carrots, sweet potatoes are rich in beta-carotene; they’re also a good source of vitamin C and fiber. In addition, they contain root storage proteins called trypsin inhibitors that show promise as potent antioxidants. 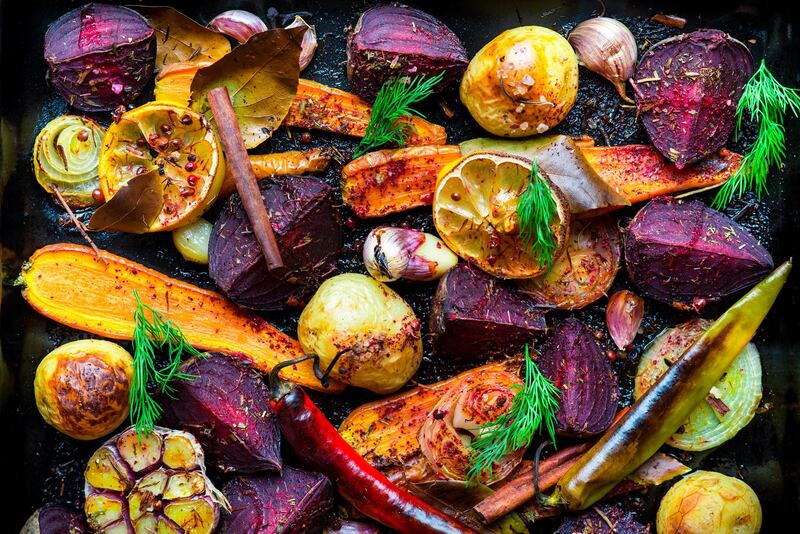 Try this: Mash baked sweet potatoes with crushed walnuts, dried cranberries, a bit of honey and a dash of vanilla extract; sauté grated sweet potatoes with diced onion and red pepper, minced garlic and canned black beans for an updated version of potato hash. Beets. In Great Britain, beets were commonly boiled and pickled, an especially evil incarnation that gave them an unsavory reputation for many years. Unsullied by vinegar, however, these ruby-colored roots are deeply sweet and rich. Beets are a good source of minerals, including iron (hence their blood-building reputation). They’re also high in anthocyanins, the same red-purple pigments found in berries and red wine that help protect against heart disease. Additionally, some studies have found that these powerful antioxidants help protect against cancer, including breast and colon cancers. Lucky for us, processing actually increases the availability of anthocyanins, so canned beets have even more antioxidant activity than raw or conventionally cooked beets. Try this: Roast whole beets in a hot oven until tender, then slice and toss with sea salt and olive oil, and serve over seared greens; layer diced, roasted beets over butter lettuce leaves and top with chopped hazelnuts, goat cheese and olive oil. Try this: Roast cubes of rutabagas and butternut squash with red onions, rosemary and garlic until tender; boil rutabaga cubes until tender, then drain and mash with a bit of maple syrup, a squeeze of orange juice, and a pinch of cinnamon. Radishes. Strewn as an afterthought on salads, or rendered into roses for garnishes on party plates, radishes don’t get much recognition. But these crunchy, spicy little roots pack a fair nutritional punch. They rival celery in their low calorie content, and are a good source of vitamin C. Daikon, a large, white variety of radish central to Japanese cooking, has a milder, sweeter flavor than the red radish. In macrobiotic cuisine, it’s served with fried or oily foods to counter their fattiness and ease digestion. In more Western terminology, daikon is an excellent source of potassium, vitamin C and folate. And both daikon and red radishes contain the anti-cancer compounds found in other crucifers. Try this: Combine diced radishes with diced mango, minced onion, chopped cilantro, and a squeeze of lime juice for an innovative salsa to serve on seafood; toss chopped radishes with strips of jicama, sliced scallions, diced cucumber raw cashews, chopped fresh basil and a bit of walnut oil, and serve on butter lettuce leaves. Burdock root. The slender, brownish-black burdock root has a crunchy texture and mildly sweet, earthy flavor; like daikon, it’s used primarily in Japanese cooking. In macrobiotic cuisine, it’s considered grounding and strengthening, and is used to counter the damaging effects of excessive sugar; it is also said to be a blood purifier and diuretic. Burdock has more modern healing benefits we Westerners can appreciate; it’s extremely high in potassium and fiber, and contains a variety of compounds with anti-cancer activity, including caffeic acid, chlorogenic acid and other powerful flavonoid antioxidants. Try this: Sauté julienned burdock root in sesame oil with shredded carrots, and season with tamari, red pepper flakes, sesame seeds and a bit of honey; when steaming rice, add slivers of burdock root, diced shiitake mushrooms and a dash of toasted sesame oil halfway through cooking.